Somewhere along the way I discovered brush pens containing refillable or non-refillable black ink – pens designed to mimic Asian calligraphy brushes. Again, these are of two general types: some kind of compressed fibrous material and actual hair brush tips. As with colored brush markers, I favor the ones with hair brushes, which do a reasonably good job of producing the flexibility of traditional sumi brushes (but with a finer tip for the purpose of calligraphy rather than painting). In the same way that I’m hooked on variable-width fountain pens, I adore the loose, expressive strokes that brush pens can make. Although I own a number of the compressed fiber/nylon tip brush pens that are fun to write with (I often use them to write greetings cards with), I rarely use them for sketching, so I’m going to focus here on the type I favor for sketching – the ones with hair brushes. Recent discoveries are brush pens with natural sable (or weasel) hair brushes similar to fine paint brushes. Overkill for a brush pen used for sketching? Probably. But I wouldn’t know without trying them! I tend to use black brush pens for a few specific purposes. One is when I want to do gesture sketches of people, and I don’t want to be tempted to get into facial features and other details. 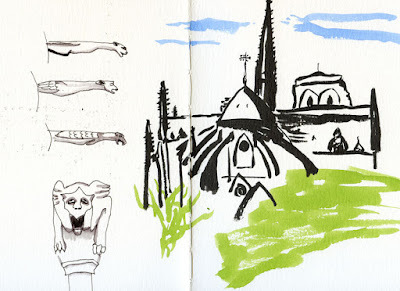 Another is when I want to sketch an intricate building that I need to do quickly – again, to avoid detail (I guess these would be gesture sketches also, if a building can have a gesture). 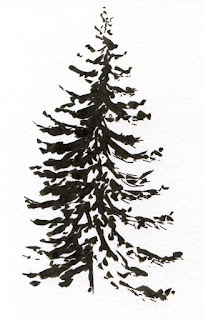 A third favorite use of brush pens is to sketch trees; the organic, free-flowing nature of brush pens seems to be made for expressing gnarly or gracefully reaching branches. 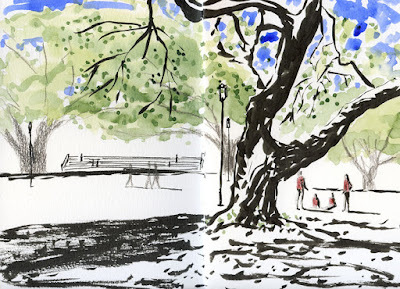 In short, a brush pen will not allow you to get too fine and fiddly, so if you have a tendency to get mired in detail while losing the overall picture, it’s a good antidote. When I was a poetry-writing student long ago, one of my favorite professors, Nelson Bentley, used to say to poets who had a tendency to get long-winded, “Try haiku: It’s a sure cure for verbosity.” I think of brush pens the same way. Yet another way I use brush pens is a more recent discovery. 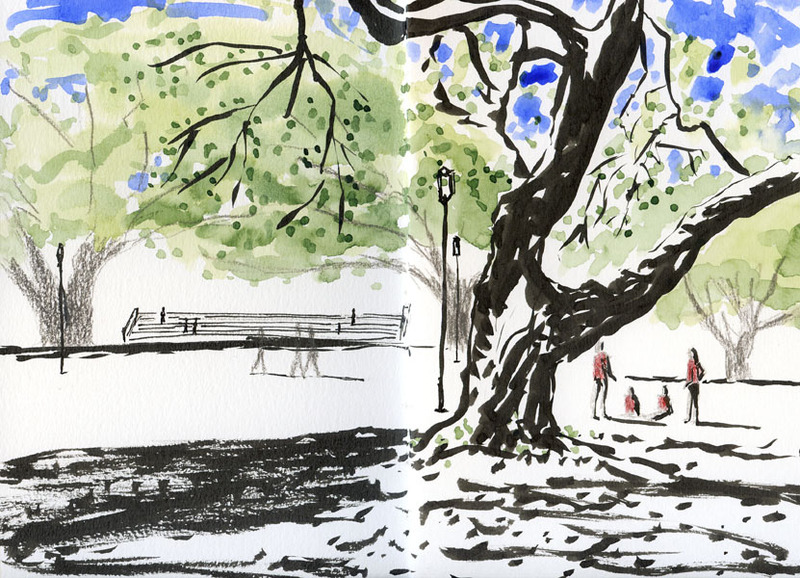 Last year after seeing Ch’ng Kiah Kiean (better known as KK) give a demo in Paraty of his twig-sketching technique, I tried channeling KK for several months. I’m still fascinated by that ultimate variable-line-width sketching instrument, and I still pick it up occasionally. What frustrates me the most, though, is that a twig doesn’t hold much ink, so I am constantly dipping back into the ink bottle after each stroke. 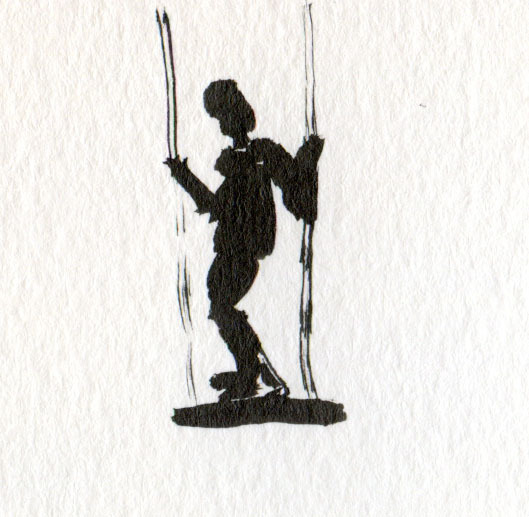 What I discovered is that a brush pen that’s running out of ink yields something like a scratchy, dry-twig effect – but without requiring continual dipping (it’s like a fountain pen, so it requires no dipping at all). Even a fully inked brush pen can make the same, slightly unpredictable, slightly uncontrollable stroke that twigs are famous for – but with slightly more control! One note before I describe the pens: You’ll see that several have names that contain the word “fude” (which means brush in Japanese). This is not to be confused with the fude fountain pen nibs you already know I love. 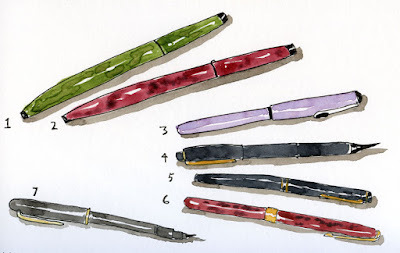 The fountain pen nibs have “fude” in their names because they, too, are mimicking brush strokes. Not shown in the sketch at the top of the page and the brush stroke comparison chart is the J. Herbin CreaPen Pinceau refillable bristle brush pen, which I had misplaced for a while and then later found. I don’t mean to discriminate against this pen – made in France, it’s the only non-Japanese example – by not sketching it. But after finding the pen, I was too lazy to re-do the sketch. 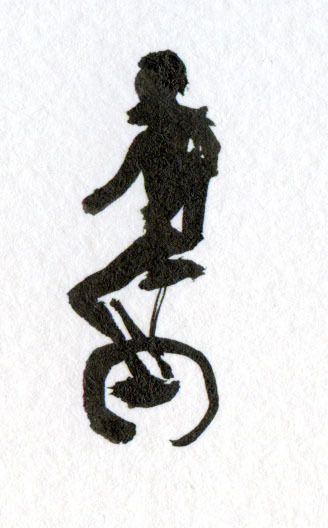 J It’s a perfectly adequate brush pen without much to distinguish it from the others. One thing to note is that it comes with three cartridges when purchased from JetPens, but the package product info does not say whether the cartridge ink is waterproof. I noticed, however, that the cartridges look exactly like Platinum cartridges, so I popped a Carbon Black cartridge on instead of one of the included cartridges, and indeed it fits perfectly. Since then, I’ve learned from Ana at the Well-Appointed Desk that the cartridges included with the pen are also waterproof. 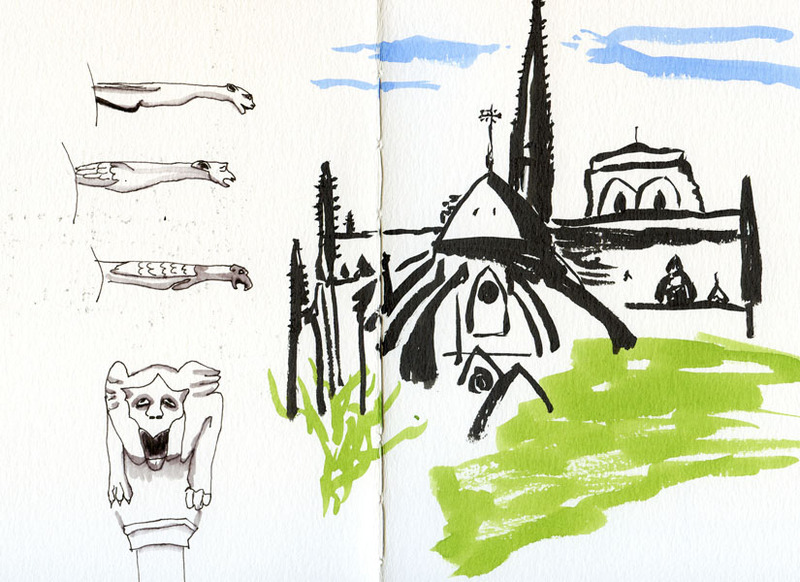 As for all the Japanese brush pens I tried, I’m sorry to say that not much distinguishes any one from the rest. 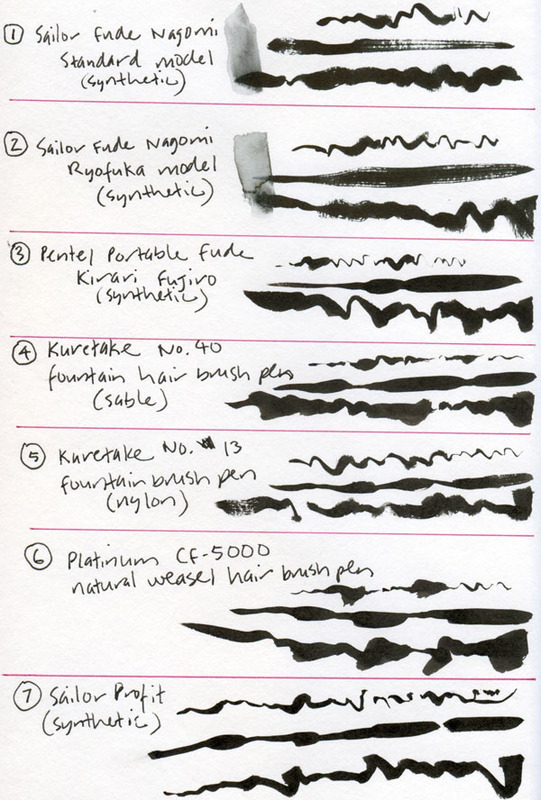 I really wanted the natural sable hair Kuretake or weasel hair Platinum to be hands-down better than the others, if only to justify the prices I paid for them. Unfortunately, that wasn’t the case. The synthetic brushes have just as much bounce-back and retain their tips as well as the natural-hair brushes. What’s more, the Platinum weasel seemed harder to control than any of the synthetics. They are all perfectly adequate brush pens, and none stands out in any extraordinary way. Nos. 1 and 2 (in my sketch and the chart above), the two Sailor Fude Nagomi pens, are the only non-refillable models among the ones I’ve tried. In addition, the ink they come with is not waterproof, which limits their usefulness in sketching, since I’d like the option of using watercolor with brush pens. Their bodies are significantly longer than the others, as they seem to be emulating traditional sumi brushes. The extra length takes some getting used to. No. 7, the Sailor Profit model, has a form factor identical to the Sailor Profit fountain pen. I find that to be both good and bad. The good is that it’s comfortable in my hand and feels familiar. The bad is that it looks just like my Sailor Profit fude pen (except that it’s black instead of navy), so it’s easy to get them mixed up in my bag. One nice thing about this pen is that the brush tip can be replaced when it wears out. No. 4 in my sketch, the Kuretake sable, also has replaceable tips. In fact, the replacement tips on all the Kuretake brush pens seem to be interchangeable. After all that, do I have a favorite? I’d say it’s No. 5 in my sketch, the Kuretake No. 13 with synthetic hair. But I admit it’s not because of any special features or characteristics. It’s just the one I’ve had the longest, so it’s familiar, and it responds well to what I do with it. As far as ink goes, the most economical, “green” choice would be to buy a refillable model, and instead of buying cartridges, simply refill an emptied cartridge using a syringe with the ink of your choice. The Sailor Profit and Platinum models are also compatible with their respective proprietary fountain pen converters. The brush tips on the Sailor Profit and Kuretake pens can be replaced, further stretching the life of the pen bodies and keeping them out of the landfill. The Pentel seems to be the most easily accessible and ubiquitous, available at many retailers online and in local stores. Conversely, I found the Platinum weasel brush only at J-Subculture.com. Great review of your brush pens. I have a few Tombows and a few pilot brush pens. I don't use them for that much, but they are handy to have at times. I like the way the Tombows bleed. Sorry for the confusion, Larry -- when I wrote No. 5, I meant No. 5 in my illustration and chart. It's the Kuretake No. 13. I'll clarify that in my post! What’s Going on at Maple Leaf Park?